We had a very special visit from my dad and The Junk Whisperer this fall and they brought me presents. And by ‘presents’ I mean they cleaned out a drawer and brought me a treasure I would have coveted had I known it was in that drawer. I clearly need to do a better job of snooping when I go home for visits. Anyway, back to the gift! The Junk Whisperer brought me a whole stack of emu leather! And then because I’m a super grateful person, I asked her if she had any more leather in different colors and could she send that to me too, please? 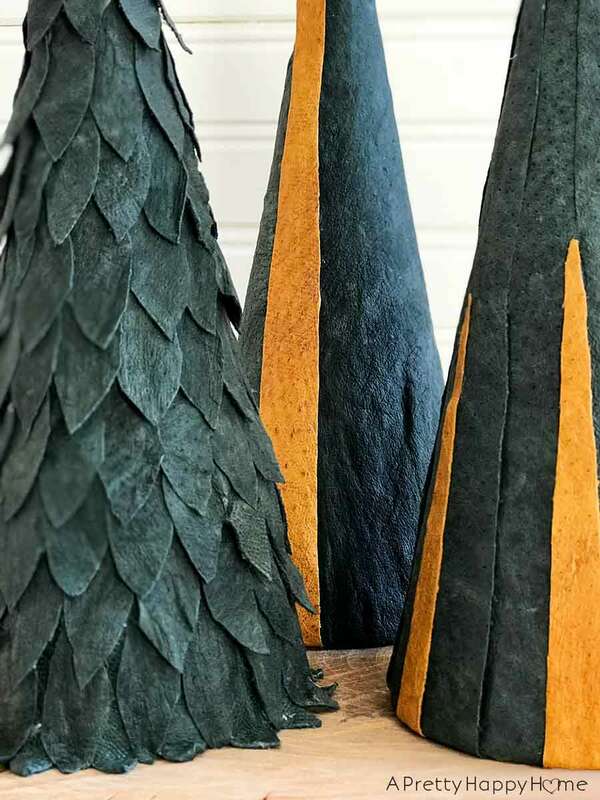 As fate would have it, she had some leather dyed forest green and that was what I needed to make Leather Christmas Trees! Christmas is the best season for crafting and I love putting my own spin on things! 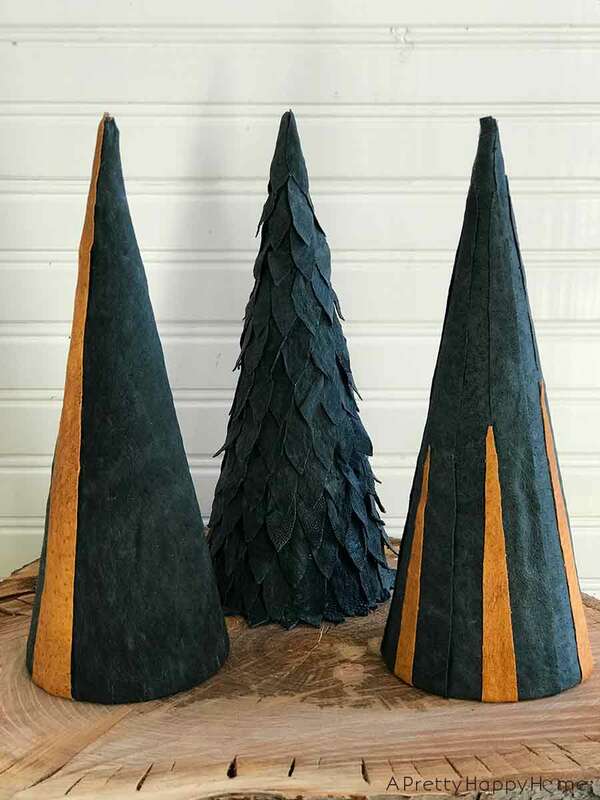 I used papier-mâché cones from Michael’s as my base for the leather Christmas trees. I suppose I could have made my own papier-mâché cones, but as I explained several years ago the first rule of papier-mâché projects is to NOT DO THEM even if it means your child will get extra credit. The second rule is to figure out if the word is spelled papier-mâché or paper mache or paper mâché. After that it was easy just to cut out shapes from the leather with scissors (it was pretty thin) and hot glue the leather shapes to my cone. Please note that I said it was easy. I did not say it was quick. That beautiful tree with all the ‘branches’ took a couple of hours to make because as it turns out, cutting out a seemingly endless quantity of leaf-like shapes takes awhile. Or at least that’s what I told my family so they’d let me craft and listen to podcasts in peace. 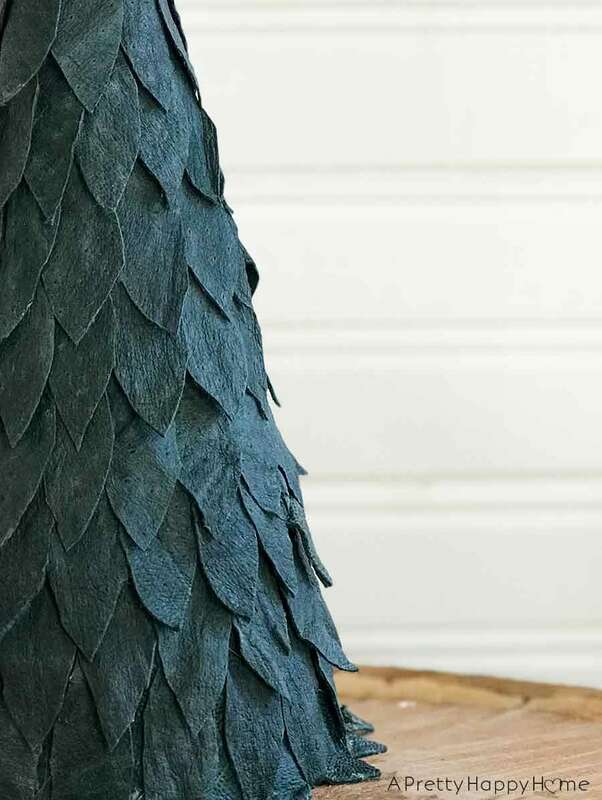 If your parents aren’t gifting you a stack of leather scraps this year, never fear! You could buy leather at the craft store. You could cut up a pair of old leather boots like I’ve done for many projects like this one. A thrift store leather jacket would work too. You could also just use this technique to DIY your own tree with a medium of your choice: felt, fabric, feathers, denim, beads, etc. The only rule is to have fun and enjoy the process. Here are some other holiday posts you might enjoy! I love the tree with the leaves. The three of them together make a nice arrangement. I’m thinking the emu leather must have been some you mom had for a project. She was also very creative like you. Can’t wait to see what your next creation brings.